Facial Cleanser, using Lemon and Peppermint extracts will gently, safely clean your skin, neutralizing bacteria and awakening your skin. Out with the old, in with the new! Reveal a brighter complexion instantly with Petal Fresh Pure Facials Brightening Scrub. Enriched with a luxurious blend of essential oils and exfoliants to gently and safely buff away dead skin cells. Fortified with our exclusive Triple-Correcting & Firming Complex, a luxurious blend of rosehip seed oil, argan oil, and grape seed oil formulated to help improve skin firmness, intensely hydrate, and boost skin cell turnover for younger, more luminous-looking skin. Facial Mask, using Avocado and Papaya extracts will detoxify all impurities from your skin, firming your skin's elasticity and increasing its inner radiance. Facial Lotion, using Açaí berry and Rosehip extracts will eliminate wrinkles and firm the skin's natural collagen elastin. 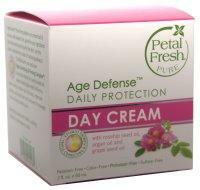 Your skin will look its best and feel healthy and moisturized all day with Petal Fresh Pure Facials Daily Protection Day Cream. Jam-packed with powerful antioxidants and essential oils in our exclusive TCF Complex. Our restorative formula gives your skin the boost it needs to help smooth fine lines and wrinkles, increase firmness, and improve luminosity. While you sleep, your skin is in overdrive, working to recover your skin and fight against free radical damage. Petal Fresh Pure Facials Deep Recovery Night Cream provides your skin with exactly what it needs to do just that - formulated with an effective blend of essential oils and potent antioxidants that will help tone, firm, moisturize, and stimulate skin cell turnover for a glowing complexion. Aloe & Peppermint Facial Cleanser stimulates your skin with refreshing hydration and naturally disinfecting Peppermint and Tea Tree extracts. This cleanser clarifies the skin tone and is designed to be used daily. Fragrance, color and paraben free. Perfect for all skin types. Aloe & Pomegranate Facial Scrub deeply cleanses your pores while absorbing excess oils and diminishing fine lines with Vitamin A and Pomegranate extracts. This scrub erases wrinkles and fine lines and is designed to be used 1 to 3 times a week. Fragrance, color and paraben free. Perfect for all skin types. Aloe & Lavender Facial Lotion moisturizes, tones and brightens your skin by increasing its collagen and healing it with Vitamin C and Lavender extracts. This lotion restores collagen and elastin and is designed to be used daily. Fragrance, color and paraben free. Perfect for all skin types. Aloe & Apricot Facial Scrub invigorates your skin to retain its elasticity while diminishing fine lines with Vitamin A and Apricot extracts. This scrub exfoliates dead skin cells and is designed to be used 1 to 3 times a week. Aloe & Cucumber Facial Peel Off Masque cools and hydrates your skin while fading scars with Vitamin E and Cucumber extracts. This masque soothes dehydrated skin and is designed to be used 1 to 3 times a week. Aloe & Pomegranate Facial Clay Masque deeply cleanses your pores while absorbing excess oils and purifying the skin deeply with Clay, Pomegranate and Green Tea extracts. This masque purifies blackheads and pores and is designed to be used 1 to 3 times a week. Petal Fresh Pore Clearing Acne Facial Wash is a powerful, yet gentle first step in your cleansing routine. Loaded with Organic Tea Tree, Lemon Peel, Rose and Chamomile extracts to deeply cleanse, as well as organic Aloe Leaf Juice and Oatmeal to soothe skin. This product also includes Petal Fresh Fairness Technology which over time, provides excellent results to lighten the signs of sun damage and hyper-pigmentation. Paraben, phthalate, sulfate & color-free. Petal Fresh Exfoliating Facial Scrub is full of natural ingredients to provide superior exfoliation and address discoloration. Apricot exfoliates gently, while organic Chamomile Flower Extract and Aloe Leaf Juice soothe the skin. This product also includes Petal Fresh Fairness Technology which over time, provides excellent results to lighten the signs of sun damage and hyper-pigmentation. Use after cleansing to leave your skin radiant and ready to moisturize. Paraben, phthalate, sulfate & color-free. Petal Fresh Detoxifying Facial Clay Masque is an excellent way to detoxify pores and deliver healthy moisture to skin. Healthy Clays draw out impurities while Shea Butter and Green Tea deliver moisture and anti-oxidants right where you need it. This product also includes Petal Fresh Fairness Technology which over time, provides excellent results to lighten the signs of sun damage and hyper-pigmentation. Use after cleansing to leave your pores clean and moisturized. Paraben, phthalate, sulfate & color-free. Facial Massage Cream deeply moisturizes your skin for maximum hydration with Aloe and Maple Sugar extracts.